The copyright holder reserves, or holds for their own use, all the rights provided by copyright law, such as distribution, performance, and creation of derivative works. Tarr, Joel A., ed. 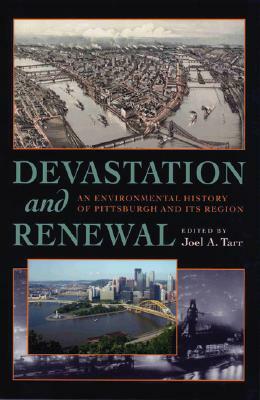 Devastation and Renewal: An Environmental History of Pittsburgh and its Region. Pittsburgh: University of Pittsburgh Press, 2011. Every city has an environmental story, perhaps none so dramatic as Pittsburgh’s. Founded in a river valley blessed with enormous resources—three strong waterways, abundant forests, and rich seams of coal—the city experienced a century of exploitation and industrialization that degraded and obscured the natural environment to a horrific degree. Pittsburgh came to be known as ‘the Smoky City,’ or, as James Parton famously declared in 1866, “hell with the lid taken off.” Then came the storied Renaissance in the years following World War II, when the city’s public and private elites, abetted by technological advances, came together to improve the air and renew the built environment. Equally dramatic was the sweeping deindustrialization of Pittsburgh in the 1980s, when the collapse of the steel industry brought down the smokestacks, leaving vast tracks of brownfields and riverfront. Read the book in full on the University of Pittsburgh Press Digital Editions.